From first times on stage professionally, to first times playing ‘baddies’, the members of the cast of Snow White are excited to start the show this Easter. LHK Productions’ ‘Snow White and the Seven Dwarfs’ will be running for 27 shows at the Epstein Theatre starting next month. 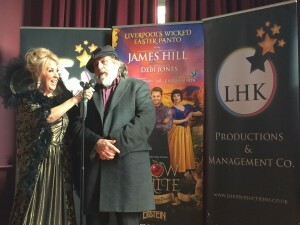 Amongst the cast are 2014 Celebrity Big Brother winner James Hill, TV and radio presenter Debi Jones, professional newcomer Georgia Austin, and Liverpool comedy actor Ricky Tomlinson. Former BBC Radio Merseyside presenter Jones will be playing the baddie for the first time ever, and couldn’t be more excited. 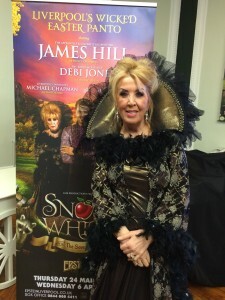 She told JMU Journalism: “I’m a great believer in waiting to see how the director wants the character to be played. When you look at Angelina Jolie in Maleficent as the wicked step-mother, she played it very different to Charlize Theron in Snow White and the Huntsman. The shows will guest star Royle Family star Tomlinson as the mirror, as unfortunately he says he was “too tall to play Prince Charming”. Tomlinson told JMU Journalism: “I’m going to make it really sarcastic, but really funny I hope. I’ll have to try and do something that the kids will understand and the adults will understand what I’m saying, but I’ll find something for the kids too. Swapping his Apprentice suits for tight trousers, Hill is hitting the stage as Prince Charming – a role model from whom he says he has learnt everything he knows. This will be his panto debut and the first time he has sung out of the shower. Georgie Austin, a dancer trained at Liverpool Theatre School, will be taking up the role of Snow White. She’s been dancing since she could remember but this will be her first time on stage as a pro. The cast don’t start rehearsing until a week before the show and will only receive the script a few days before then. The first show opens on March 24th at 7pm and tickets are priced at £16.50.